And here is your dose of cuteness...the VLC's son Bullwinkle. That's the barn owner where he lives with him, not his owner, but you can sure see how fast he's growing! He was the LAST colt of the season at his breeder's so this is not an early one...I will bet he's going to be bigger than his dad. I am so thankful he found a great home - look at that lovely fence. He is also out with another colt now for which I am equally thankful. They really do need buddies their own age! So, I'm still working on the web site and still not riding but I can give updates on previous horses I've talked about here. The VLC is still a little off and doesn't mind it a bit. I have so far played nothing but phone tag with the vet that is also a chiro, but I really want her because, after all, why not call the vet who is also a chiro and kill two birds with one stone? Also, my friends think she's a goddess. So I'm still trying. He doesn't mind the layoff a bit. He is entertaining himself playing with his gelding friend and doing things like systematically pulling bags out of the trash and throwing them all over (I always forget he's THAT big and he can reach over fencing the other horses can't and cause mayhem). I haven't been able to blanket him as heavily as I probably should, because I'm always worried he'll get hot during the day when I'm not there, so he's only wearing a lightweight one and has haired up like a yak. Could be the next thing we'll be teaching when he is sound is bodyclipping! For VLC fans who would like one just like him, but a gelding, I noticed Clyde is for sale. 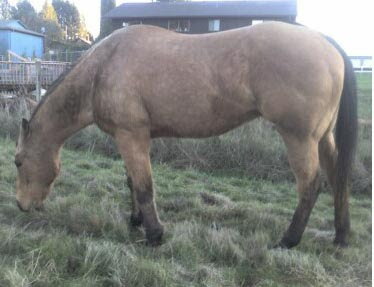 Clyde is a 17 hand gelding by the VLC's sire and he is reportedly the quiet, willing, trail safe gelding of your dreams. Registered AQHA, not sure if he's PHBA but he could be. The pictures show they are not exaggerating his size! Lucy may be going out to a friend of mine who has a daughter who can ride anything - we're working on that. It has not worked out for me to do anything with her because, due to conflicting work schedules, no one is ever around to be a ground person for me and I'm just plain not getting on a horse who is squirrely to mount and dismount without a ground person. Friend's barn has ever-present trainer and lots of other people always around. We are still trying to ID Lucy and I have submitted a search to the Thoroughbred Protective Racing Bureau which is known to get results where the Jockey Club can't. Bessie had her VLC filly, Libby, weaned off of her and neither one cared. Bessie then headed out for training with Monica Stephens who will be finishing her under saddle. Apparently the month I put in messing around with her with wild filly at side was completely adequate for Bessie to think she was broke, if not going to work too hard at it - her new kid has been riding her all around the home property, sometimes double with friends. Yes, with helmets. Bessie loves, loves, loves the attention. My friend who feeds in the morning at Monica's tells me that every morning, Bessie is flat out in the shavings in her box stall, clearly not believing her good fortune. She was born and raised on an Idaho ranch, came through the Yelm auction and then lived in a big broodmare herd. The whole stall/spoiled life is a completely new experience for her at age 10 and she is eating it up. They have also discovered she has the ability to pin an Uncle Jimmy's Hangin' Ball up against something no matter where they hang it, and eat the whole thing...Yes, Bessie is happy. I am not sure how happy she will be when training begins December 1st and she learns she is actually going to have to, like, canter with a rider and, you know, break a sweat but I guess we will find out! By the way, I noticed Bessie's three year old daughter on DreamHorse...bad picture, but might be worth checking out if you're local and looking for a project! She sounds like she got Bessie's people-friendly disposition. This is the foal she was carrying at the auction, from the stallion in Idaho. The Drama pony returned to her owners and is jumping with their adorable 5'0, 100 lb. friend Heather in the saddle. I will get pictures as soon as I can. She is so damn cute. They almost took her to a schooling show last week but decided she was not quite ready...but that is coming soon. I like the role I played here - it's the same as I did with Connor, another rescue pony who turned out great. Connor was broke out by Juliane of Cowgirl Spirit. I had him for a while and did more finishing and put a canter on him and leads. Then he got sold to an event trainer who finished him the rest of the way and now he lives in luxury at an "A" barn. I realized we have a little theme here going on the updates and it is a good one to bring up...you know, you don't have to be the one who gets a horse get trained from start to finish to be successful. It's perfectly fine to do what you are able and then pass them along to someone else for a next step. I see people who are driving themselves crazy because they don't have the ability to take the next step, and why? Do what you can. If that means doing all of the groundwork, great. If that means putting the first 30-60 days on, great. If your niche is more finishing and fine tuning, that's great too. Horses need people who can do all of these things, and they're not going to be traumatized if they have a couple different trainers along the way. And with rescues, we all need to work together to ensure they get as trained as possible and on track to great homes in the future. My Big Gold Yearling is ecstatic - I found new boarding for him where he is out with a weanling Thoroughbred colt. They run. And run. And run some more. I had no one his own age to turn him out with and he would just stand in a corner of the paddock and sulk. This is so much healthier for him. He is fat and filled out now and looks so good - the yearling ribby stage had me at my wit's end despite the vet telling me he has fine - he just looked so lousy, you know? Fortunately it really was a growth stage and he looks good now. I may actually get a picture of him I'm not horrified by sometime next year. :-) The Crabby Old Bat moved to the same place, as it could offer the mud-free pasture she needs to stay as sound as possible on her creaky old legs, and my other two old mares are going this weekend. Clover of course stays home as she needs her hot mush twice daily, but at 35 she also is fine being turned out in a small paddock, while the rest of them aren't. Crabby Old Bat is very happy. She walked through the hot tape the second day and moved in with the barn owner's four geldings. I thought that was going to be a disaster but she merely established herself as the Queen of the Pasture and now has a 17 hand gorgeous Seattle Slew bred gelding who is in love with her. Go figure. Love is blind. Casper returned to Cowgirl Spirit and they have taken her out trail riding and she did fabulously. Acted like it was all old hat to her. Didn't spook at a thing! That's pretty much what I expected since nothing ever bothered her here. She did figure out that she could revert to her stubborn/sticky behavior with some riders so Juliane is working on training that out of her. She is, of course, still available for adoption and does come with her APHA papers so she is eligible for all of APHA's riding and showing programs. Not much to write about because not much is happening! I'm trying to get in touch with a highly-recommended chiropractor to give the VLC an adjustment and see if we can get him back to 100%. I'm sure if I trotted him past 100 people, 99 would ask me WTF I was talking about, but one of you would see what I'm seeing...slightly uneven on the left hind. I've been keeping him in more and only turning out in the arena since we've had a monsoon here and everything outside is slop. He doesn't seem to care. He's certainly an easy horse - he's happy living outside, he's happy living in a stall. Nothing in the world stresses this horse. He'll deal well with the horseshow life. We're taking it very slow with Lucy. She's still very nervous about ground work so the current goal is longeing at the walk without thinking we're going to eat her. She remains unconvinced, but I think it will just take time. She's so much better on the ground than she used to be that I know she'll come around with time. We are still trying to ID her - I sent off pics and info to the Thoroughbred Protective Association for the really high-tech search this week so I'll let you know if we get a hit! The Drama pony is doing very well. As I think I mentioned, we found an even smaller rider for her - and one who has more recent jumping experience - so she is learning to jump and getting close to being ready for her first schooling show. I can't wait to post those pictures so you can all see - she is just adorable over fences, but they have to be high enough or she is lazy. It's just so easy for her. All right, hopefully someone else has something more exciting to report! I may have a new project to talk about soon, but I'll bet some of you have a new project already. Fill us in! I'm writing this for someone I know reads the blog but I won't ID them. I think it's something a lot of us went through with our first horse and I'm hoping someone can offer some helpful advice. By the time I got my first horse, I'd been in lessons for nine years and was already working polo ponies. When you polo groom, you are 100% responsible for making sure that 6 horses stay the right weight, fit, and completely sound. You get used to inspecting legs daily and memorizing what they look like. You know right away if a horse isn't quite right or something feels or looks different. It's great experience and I'd recommend it highly to any of you younger riders who want to really learn horses inside out and learn to ride a variety of temperaments consistently well. So, growing up in that, I didn't really have the "new mom syndrome" that so many people go through upon purchasing their first horse. You know what I mean. If you're a boarding stable owner, you've likely encountered this person. They may get upset if their horse has a little hay in his water bucket, for example. I dump buckets once a day, when I clean stalls, and I assume other good barns do likewise. That said, horses like to throw their hay in their bucket and some actually wash their hay. The crystal clear perfection accomplished at cleaning time usually only lasts 5 minutes once the horse goes back into the stall. This kind of owner will just about have heart failure if their horse comes in from shared turnout with a bite mark, and your reassurances that this is just what horses do won't assuage their level of upset. This owner worries nonstop about their horse and is often calling upon you to look at it and see if you think it looks thin or is acting sick. Now, while we all far prefer this owner to the owner who doesn't notice if their horse is thin or acting sick, after a while we end up rolling our eyes when the person heads our way. Their horse is fine, why can't they see it? Like I say, I never really went through this. I've always had horses, I've usually had multiple horses. If they get a cut, they get it washed off and treated. I don't worry that they're going to die unless they're colicking or something that I know is truly life-threatening. I can't really put myself in the shoes of an adult who didn't grow up in the barn and is experiencing a constant and continual fear that she is not taking good enough care of her horse, when in reality it's obvious to everybody but her that she is taking exceptional care of her horse, with the exception that her worrying has resulted in his having to change barns a lot. It sounds to me exactly how (I hear!) people are with their first baby...where they are just convinced they are doing it wrong and will somehow kill it. If you can relate to this syndrome, I'd really appreciate your posting your story or your helpful advice.